Instead of rain it was goals that poured down this week as the 11 first team fixtures in the Central Midlands League produced an amazing 61 goals between them. Belper United consolidated their position at the top of the Black Dragon Badges South Division by trouncing a struggling Bulwell side 11-1 at Christchurch Meadow. The Bulls got off to an unfortunate start conceding an own goal as early as the ninth minute, and were four down at the break as Ben Stockley added two more and Sam Vickers one. Belper really piled on the agony in the second half as Stockley and Vickers completed hat-tricks and Dean Oliver rattled in three of his own. Alfie Holland was the home side’s other scorer, Liam Towle’s 86th minute effort for Bulwell providing little consolation. Hucknall Town followed up their midweek win over Holbrook St Michaels with another three points at Matlock Town Reserves, their 5-0 victory putting them into second place in the table. Leon Aikman scored twice for the visitors, Michael Banister, Niall Thompson and Josh Henry were also on target as Hucknall took their winning league run to five. Southwell City will enjoy a happier Christmas after posting their first win of the season at the 16th attempt. And what a scalp it was as they travelled to Clay Cross Town and found themselves four goals up after 55 minutes. Jonny Nussey opened the scoring with a 13th minute penalty and Billy Pycroft doubled the score by the interval. Two quick goals from Stewart Gill and Dean Carpenter followed and, although Ryan Ordidge and Joe Harris pulled two back for the Millers, City came through 4-2. Pinxton showed no signs of fatigue after their gallant efforts in the FA Vase on Thursday night as they came out on top 5-0 at Holbrook St Michaels. Five players shared the goals. Pete Stubley and Tom Ellis putting the visitors two up at half-time with Chris Gilson, Chris Shelton and Luke Walker all finding the back of the net in the second period. Keyworth United ended a seven match winless run by beating Linby Colliery 2-0 at Platt Lane. Corey Johnson gave them a first half lead, but the game was in the balance until Conner Parkin’s 88th minute goal finally secured the points. Top scorers of the day were Askern who put 13 past Welbeck Welfare in the Black Dragon Badges North division. 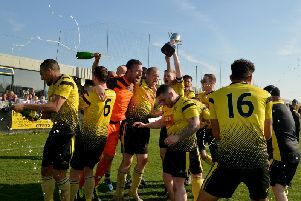 Eight players found the net, but it was Shane Carver’s day as he helped himself to five goals, with the others coming from Gary Mundy, Joe Warren, Shaun Mundy, Alex Rennie, Jason Kearsley, Jordan McCabe and Josh Illman. The other two came courtesy of the visitors. Phoenix missed out on a chance to reduce the gap on leaders Glapwell as an exciting end to their match at Easington United saw them go down 3-2. The visitors got off to the perfect start with Steve McDonnell scoring in the first minute, but Danny Barron levelled things four minutes later. It stayed that way until ten minutes from the end when Danny Conman put Easington in front, and in a hectic finale, McDonnell scored his second in the second minute of added time only for the home side to straight down to the other end where Mark Hutchinson snatched a very late winner. After seven straight defeats, Bilsthorpe had a morale-boosting 5-0 win against Thorne Colliery at Eakring Road. There were two goals each for Craig Gould and Nick Langford with George Simpson also on the scoresheet.